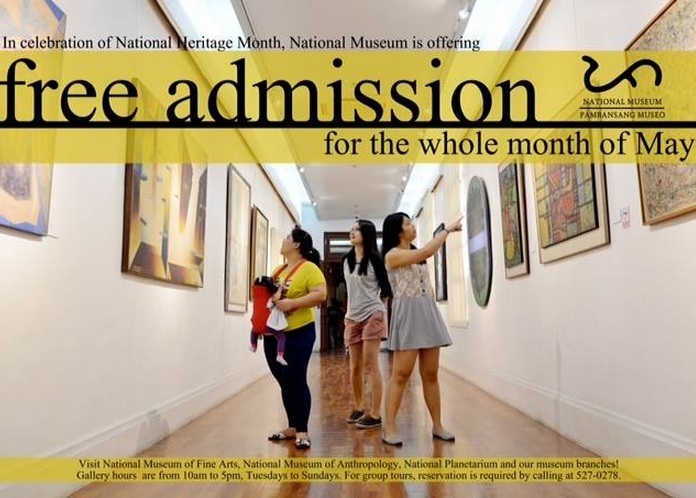 In celebration of the National Heritage Month, the National Museum of the Philippines announced that admission to all National Museums will be free for everyone this May. Free admissions will also apply to regional sites including those in Vigan, Kabayan, Kiangan, Angono-Binangonan Petroglyphs, Tabaco, Bohol, and Butuan. The announcement on social media was liked by a lot of netizens, many of them saying they will avail of the free entrance. It seems that groups of friends are making plans to choose and visit museums as part of their itinerary for their summer happenings. Well, why not? The National Museum and its regional branches give a glimpse into our country's rich culture and history. Visiting a museum will do you more good than just watching tv or lazing around the couch with your devices. Explore the National Museum for real. Don't be content with just seeing images and videos on the small screens of your smartphone, tablets, or laptops. Bring along your family and friends, be they local or foreign. Everyone's welcome to experience the visual spectacle that the country's National Museums can offer. 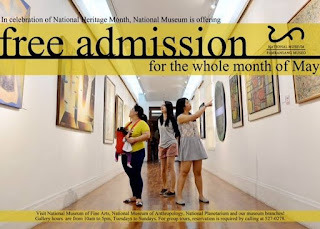 If you plan to visit the National Museum in the City of Manila, it's open Tuesdays to Sundays from 10 A.M to 5:00 P.M.
From May 3 to the end of May, admission is totally free. But after May, regular entrance fees will revert to P150 per adult, P50 for students, and P120 for Senior citizens . On Sundays, admission is free. If it's your first time to visit, take note that firearms, food, bottled water, and ballpens are not allowed inside the galleries.Picture taking is allowed only as souvenirs BUT flash photography is prohibited. Smoking is also prohibited. For other information and guidelines, visit the National Museum website at www.nationalmuseum.gov.ph.